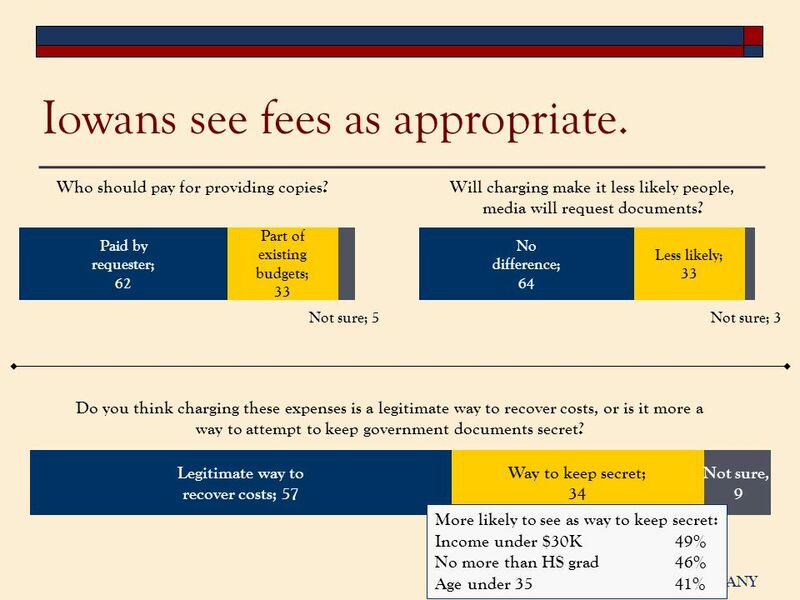 & S ELZER C OMPANY & Iowa Freedom of Information Council September 2011 Survey of Iowans. 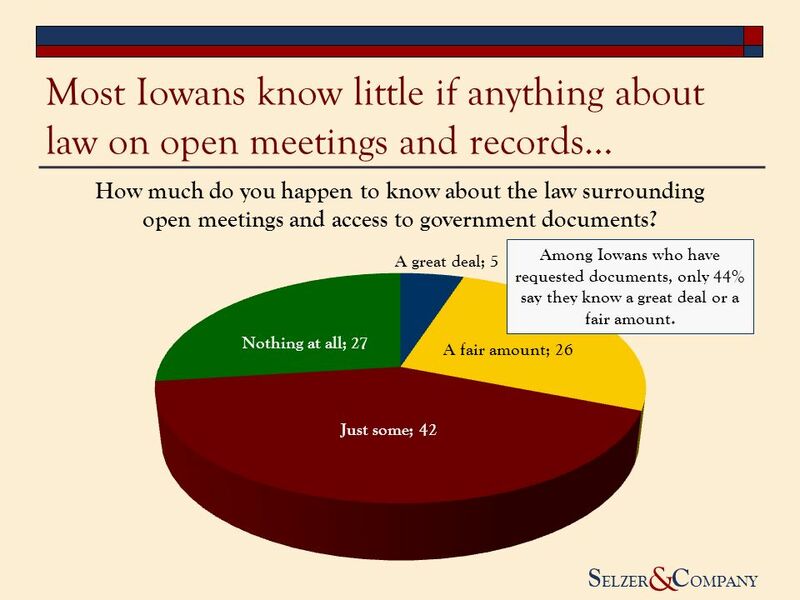 4 S ELZER C OMPANY & Most Iowans know little if anything about law on open meetings and records… Among Iowans who have requested documents, only 44% say they know a great deal or a fair amount. 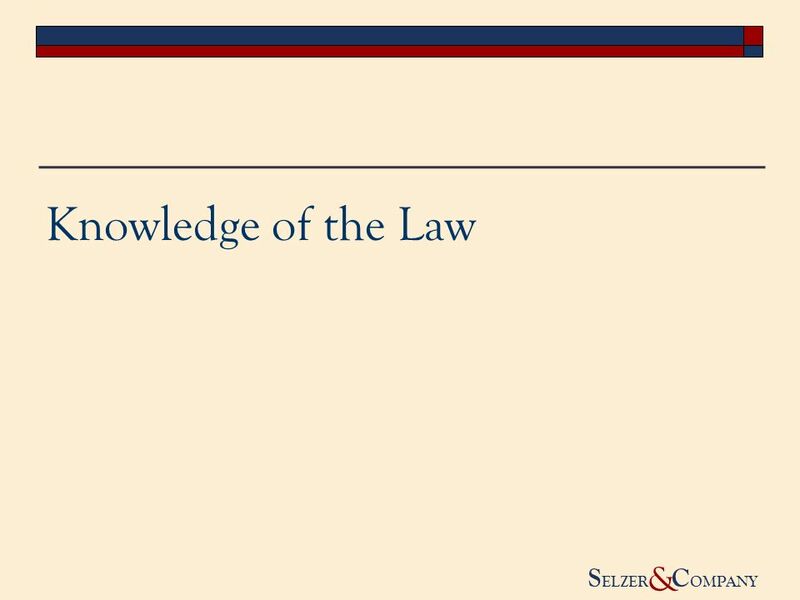 5 S ELZER C OMPANY & …but virtually all know the law is for all citizens. 7 S ELZER C OMPANY & Iowans show some skepticism. 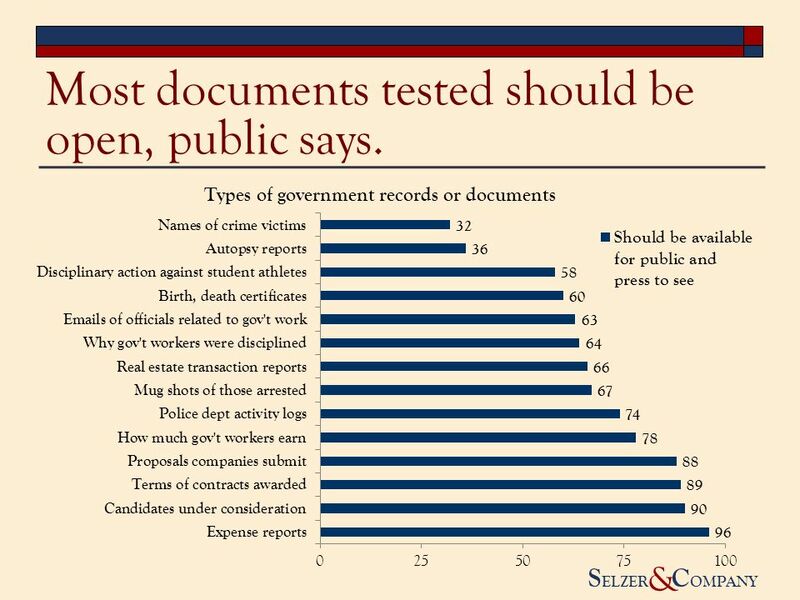 9 S ELZER C OMPANY & Most documents tested should be open, public says. 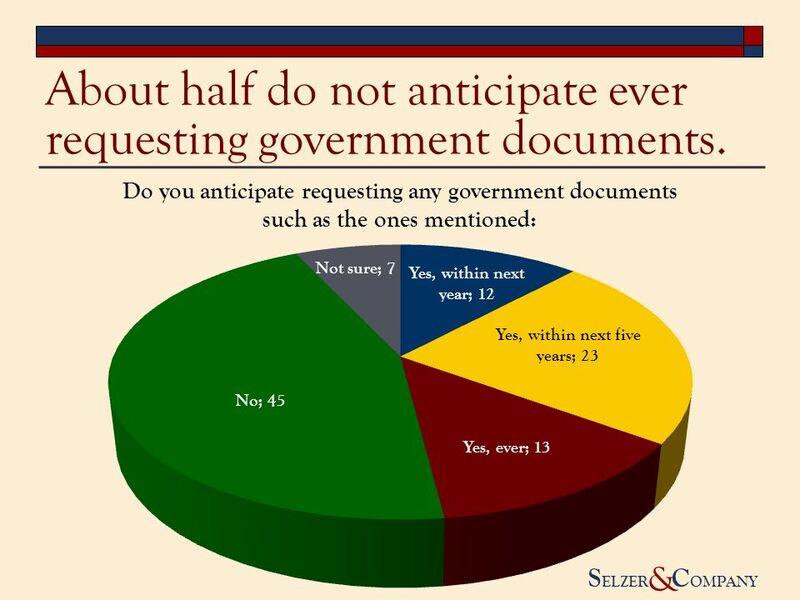 11 S ELZER C OMPANY & About half do not anticipate ever requesting government documents. 15 S ELZER C OMPANY & IFOIC has low profile. 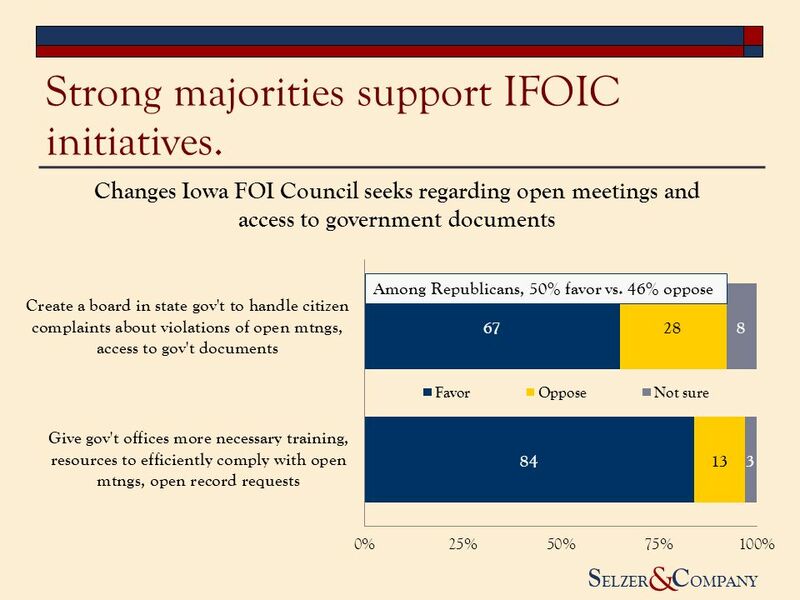 17 S ELZER C OMPANY & Iowans see taxes paid as foundation for open access. 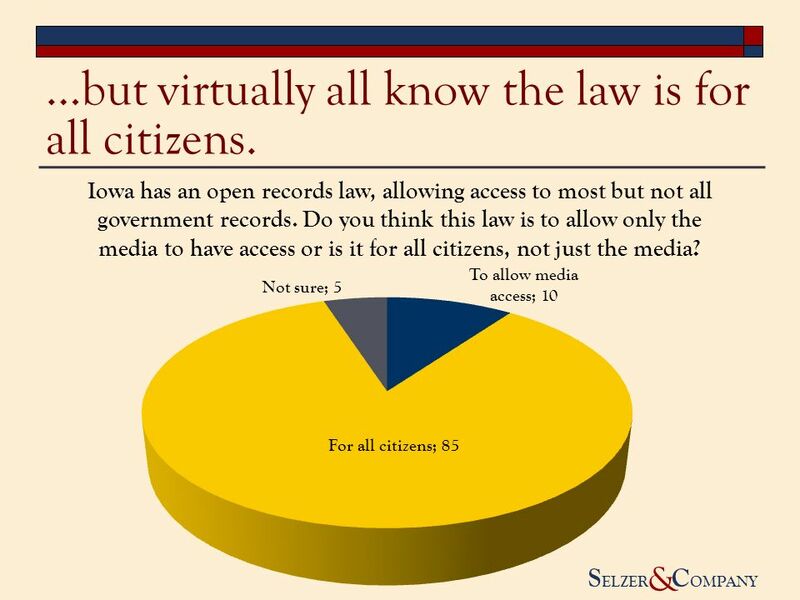 18 S ELZER C OMPANY & Iowans minimally resist openness; when they do, it is to protect privacy. 19 S ELZER C OMPANY & Summary. 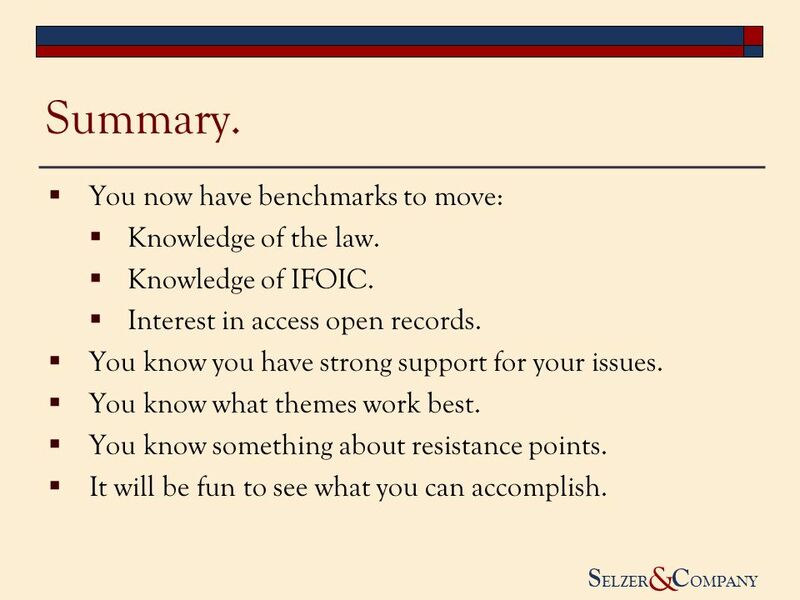 You now have benchmarks to move: Knowledge of the law. 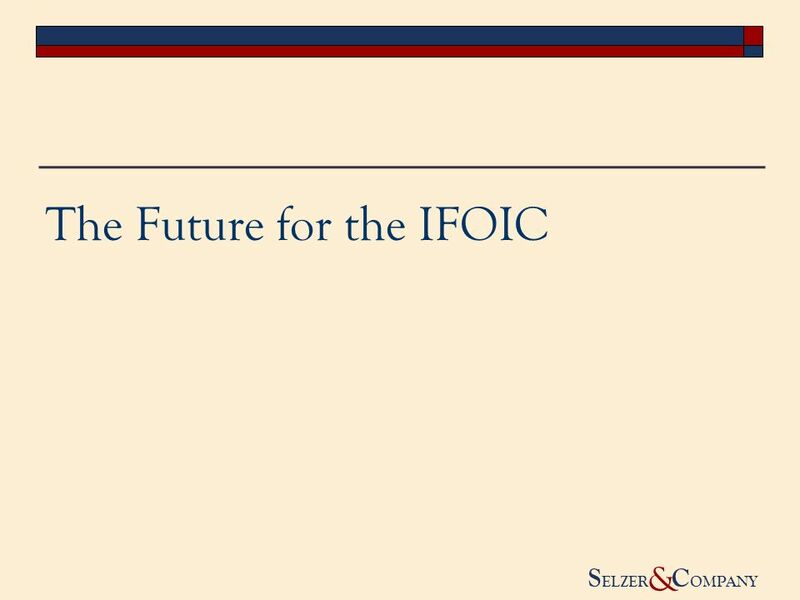 Knowledge of IFOIC. 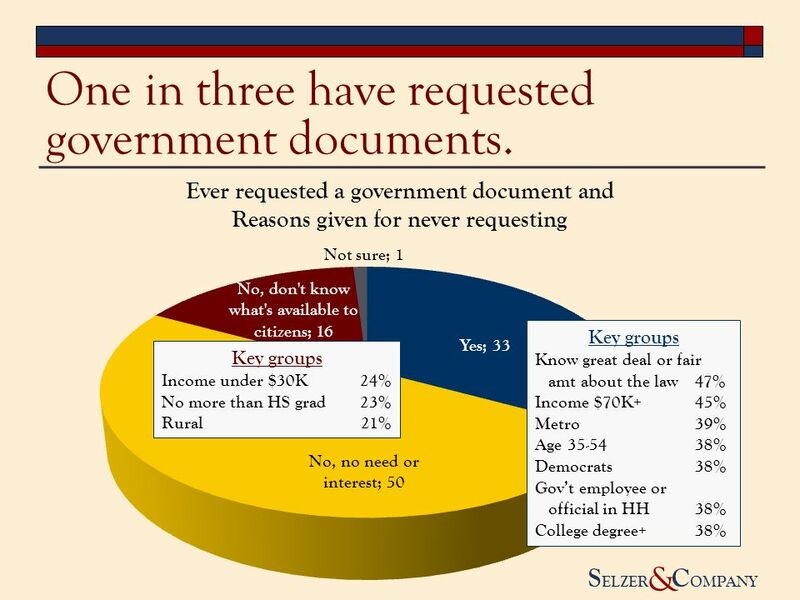 Interest in access open records. You know you have strong support for your issues. You know what themes work best. You know something about resistance points. It will be fun to see what you can accomplish. 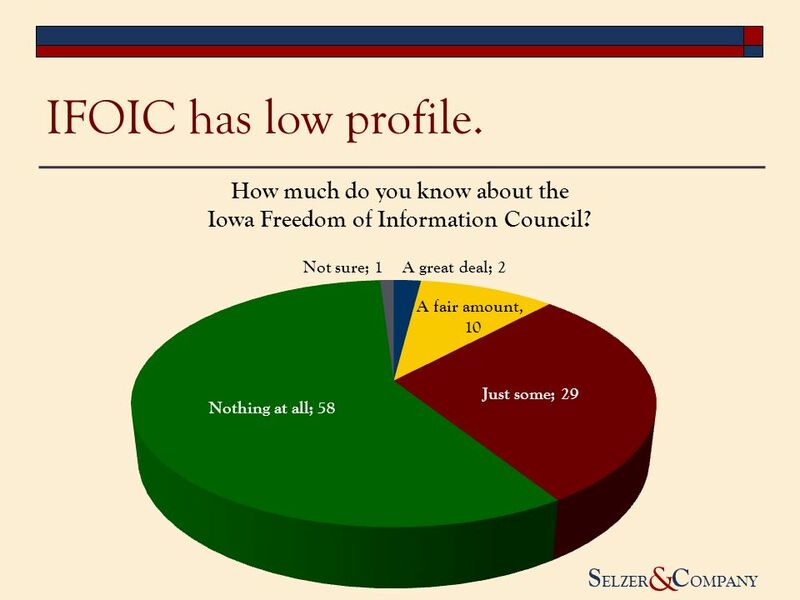 Download ppt "& S ELZER C OMPANY & Iowa Freedom of Information Council September 2011 Survey of Iowans." Parlemeter – Autumn janvier Methodology. Washoe County Citizen Survey December th Citizen Survey conducted since 1995 Statistically-valid; proportional to and representative of county population. Ann S. Bisconti, PhD Bisconti Research, Inc. Why Public Opinion about Nuclear Energy is Changing. Strategies for Increasing Efficiency of Cellular Telephone Samples Kurt Peters 1, William Robb 1, Cristine Delnevo 2, Daniel A. Gundersen 2 March 2014. Conducted for: Conducted by: December Method Nationwide telephone survey of households Household members age 6+ enumerated Data on tennis participation. Washington News Council July 2001 ELWAY RESEARCH, Inc. 12 The Daily Local News: Most Watched Television; Fewer than Half Read Newspaper or Listened to. 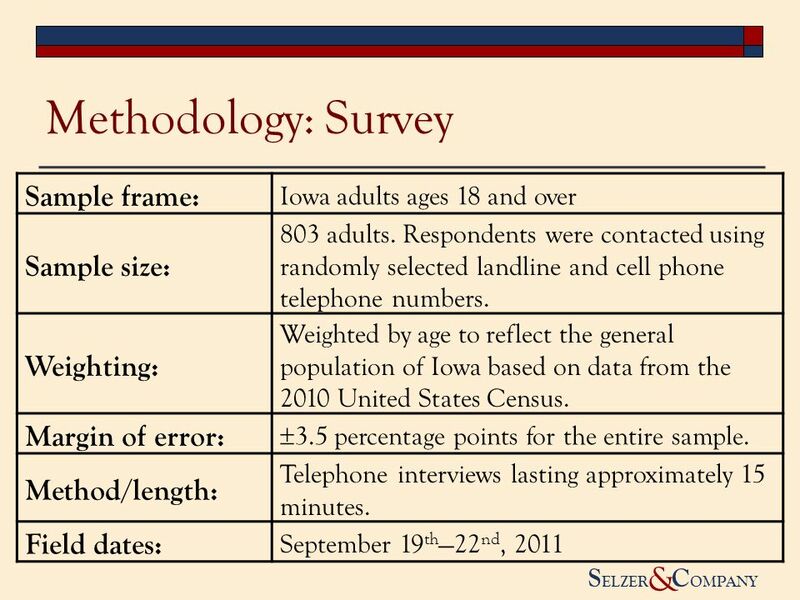 Coverage Bias in Traditional Telephone Surveys of Low-Income and Young Adults Centers for Disease Control and Prevention National Center for Health Statistics. City of Alamosa Customer Satisfaction & Residents Priorities Survey By: Dr. Melissa L. Freeman Assistant Professor Adams State College. 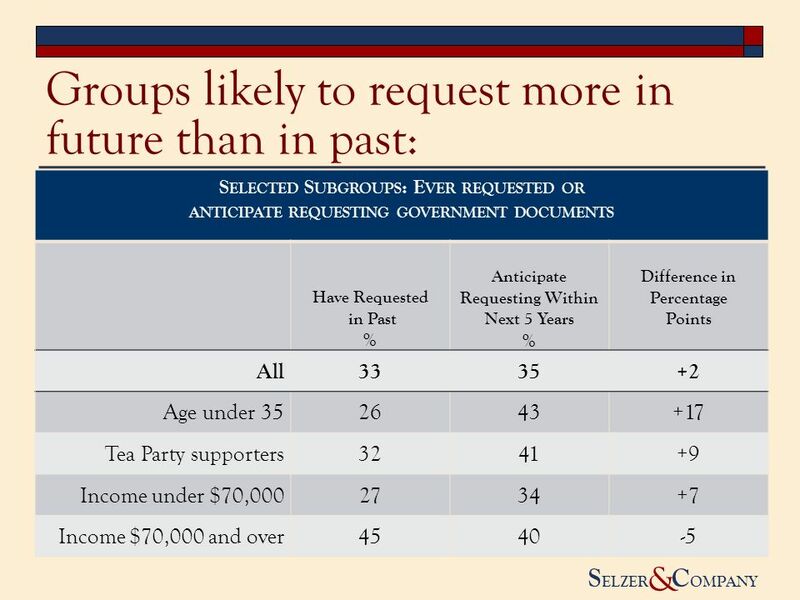 Item Nonresponse in a Mail Survey of Young Adults Luciano Viera, Jr., Scott Turner, and Sean Marsh Fors Marsh Group LLC. 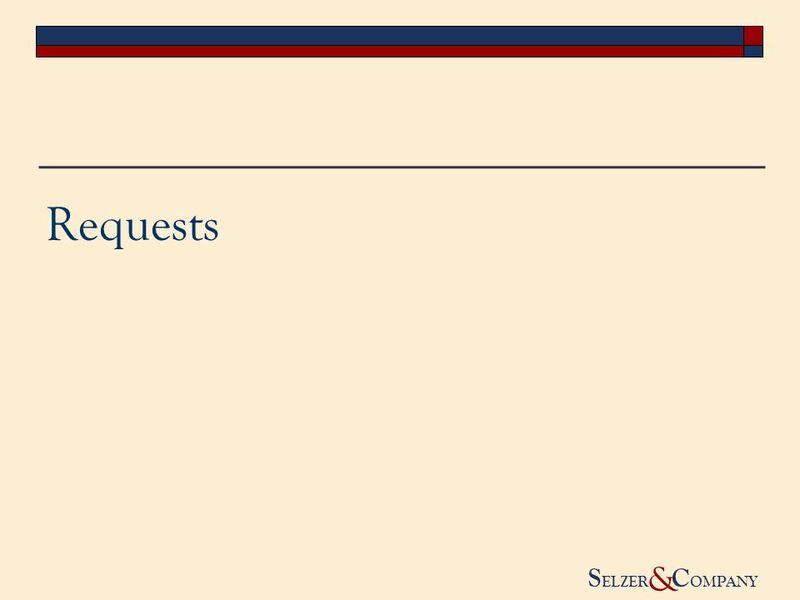 Online Privacy Survey Results Conducted: December 2011. GE Smart Grid Survey June, /2/2014 Table of Contents Background & Methodology Key Findings Detailed Findings Demographic Trends Demographic Profile. 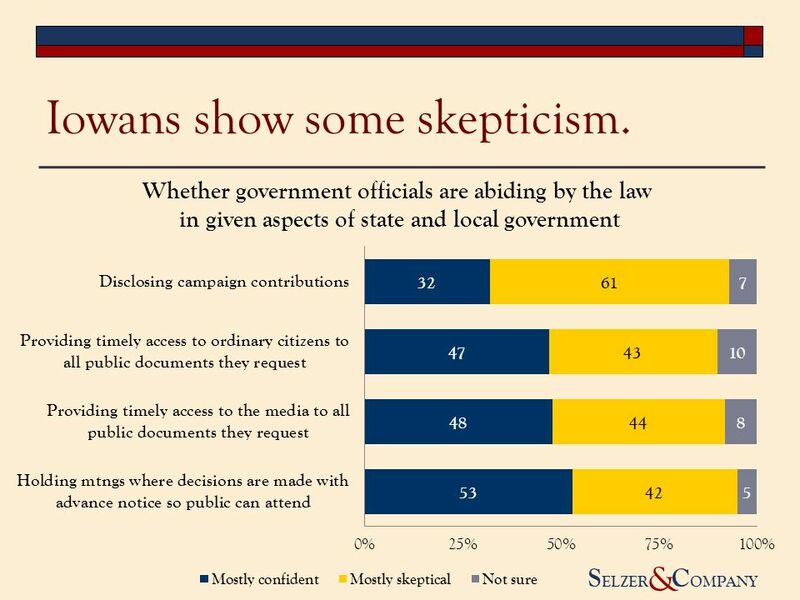 Key findings from a survey of 400 registered Washington voters conducted Sept. 25-28, 2014.